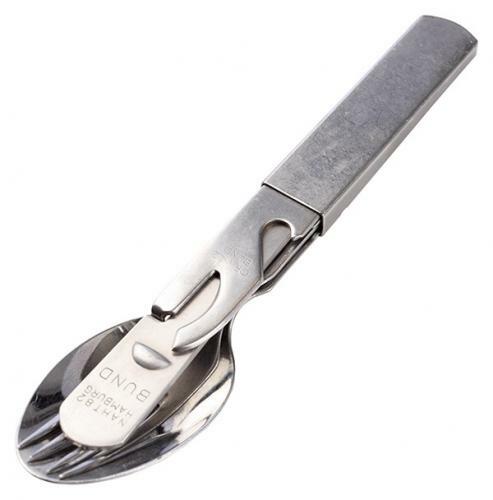 This German eating utensil set contains it all: a bottle opener, can opener, knife, spoon and a fork, every one of them a separate item that folds neatly into a nice package for storing and carrying. The can opener is more like a can't opener. Maybe we should send someone to join the German Bundeswehr, because damned if we can figure out how to use this thing. Luckily most cans these days can be opened with a pull tab. Made from stainless German steel. Some countries might have some restrictions for importing sharp objects. We take NO responsibility about these matters. Please make sure BEFORE ordering. Purkinavaaja on itse asiassa aika kätevä vaikka perinteisesti ajatellen se voi vaikuttaa ihan toivottomalta. Reiän voi säilyketölkkiin tehdä "normaalisti" 90 asteinen kulmapala purkin ulkoreunan alla, käyttäen "pistintä" purkin läpäisemiseen. Sen jälkeen kannattaa käntää koko avaaja toisin päin ja pitää se 90 asteen kulmapala purkin reunan päällä, näin saa koko leikkuuterän pituisia viiltoja tölkkiin. Ingenious design, I can toss the whole setup into my pack without fear of it coming apart and scattering around. 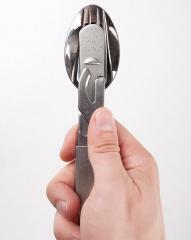 Easy to clean durable stainless steel, though mine has a small rust spot on the knife, otherwise no issues. Spoon is very much sized for maximum food shoveling efficiency. Fits together perfectly and is easy to pack/unpack. Painaa kuin synti ja lusikka liian iso. Muuten todella hyvä. Ensimmäisellä uudelleenkokoamiskerralla luulin, että kyseiseen hommaan tarvitsee vähintään maisterin tutkinnon,mutta toisella kerralla oikea tyyli selvisi. Toivottoman painoiset aterimiksi, mutta ainakin ne kestää. En ottaisi reissulle missä kaikki tavara kulkee selässä, näitä löytyy kevyempinäkin. Well made. Should last forever. Best Cutlery Set you can get. Omani ostin Clas ohlsonista hintaan 9,99€. Tuotteen avaamisen ja uudelleenkasaamiseen meni kaksi kertaa, eka kerta vaati sen että sain pullonavaajasta viiltohaavan sormeen. Toisella kerralla meni ongelmitta. Good quality and sturdy and easy to keep clean, and you can (get it?) open cans with it, but I`ll let you figure out how to on your own. The spoon is also precisely the right size for eating your friends food while he isnt looking or digging a trench system, the decision is up to you. It's very heavy, but robust. The Germans must have freakishly large mouths because the spoon they put in this thing is more suited to digging a foxhole than for eating. I will attempt to cut it down because it hardly fits in my mouth. I'll admit my mouth is on the smaller side. I'll use it for car camping and maybe hiking. The spoon can double as an entrenching tool. Everything is awesome. 1962 German rostfrei steel can't be beat. Yes! A set that does not rattle! These are well made and the real deal. Mine came seemingly new with a few storage scratches. Good quality and I love the price. If you going to buy this item do not get just one. Order two of them (you'll be glad that you had the good sense to do so). I have one set I use daily at work, rather than using the plastic stuff. The other one is packed away with my camping gear. 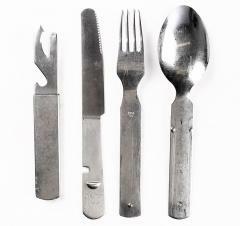 The best camping silverware you're gonna get for the money. Mine came in like-new condition with just a little gunk on it. Fits together awesome. Tosi hyvät aterimet. AIemmin käytössä lähinnä muovisia sporkkeja ja niitä markettien kamalia tapeilla toisiinsa kiinnittyviä teräsaterimia, nämä ovat huimasti miellyttävämmät. Minulle lähetetty setti poikkeaa yksityiskohdiltaan hieman kuvista, mm. veitsessä ei ole sahalaitaa. Mine came as NVA instead of Bundeswehr. Same style but not the same quality. I would still recommend it, but not for 10 dollars. the look, the feel the sharpness. It impressed me so much, I decided to fetch me another pair. They don't rattle, and stay tightly in place! Ordnung muss sein! Näpsäkästi ja turvallisesti tiukassa nipussa kulkeva setti, joka toimii niin toimiston pizzaperjantaissa kuin reppureissussakin. Vähän painava. Purkinavaaja on täysi mysteeri. To use the can opener ( how many cans are left without those pulltops?) pierce the lower prong into the rim. Next, in some evil pagan act lift the tool @ 45 degrees in a COUNTERCLOCKWISE left hand of ( fill in your diety) action in a fulcrum action with the upper prong holding the lid as the lower cuts. Repeat until you have access to the food. After that you are on your own with whatever table manners your family womenfolk were able to beat into you. Real nice set. Half the utensils are brand new. Everything fits nicely.